One of the most important features in any bathroom is the bathroom sink. The bathroom sink has the ability to set the tone for the entire bathroom and is the most used item in the entire bathroom. For this reason, many people choose the reliable and stylish American Standard sinks for the bathrooms in their homes. In many homes, the bathroom sink sees a great deal of use on a daily basis. There are dozens of things that a bathroom sink can be used for on a daily basis, such as washing your hands, brushing your teeth, rinsing out items, or shaving. The American Standard sink is built to withstand the heavy usage that the majority of bathroom sinks go through with a thick glossy finish that is easy to clean and is stain resistant to most chemical and biological agents. There are many different types of the American Standard Sink to choose from, allowing shoppers to choose the one that best fits their needs. One of the most popular styles of sinks today is the wall-mounted sink. There are a number of different ways that the sink can be mounted on the wall, allowing for a wide range of style designs, and the sinks are sturdier than some other types of sinks, making it a godsend to households that contain small children. 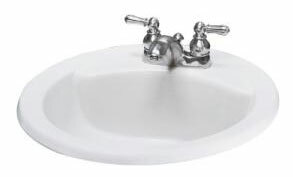 Another popular type of American standard sink is the pedestal sink. The pedestal sink is generally comprised of a single slim pedestal base with the sink basin installed in the top. These types of sinks are generally used when the amount of available space in the bathroom is limited or the person preferred the thinner, streamlined style of the pedestal to the thicker base of a wall mounted sink. There are some people that prefer the under-counter style of the American Standard sink because it frees up a large amount of usable counter space. Under-counter sinks have no rim to catch debris, so the sinks are also easier for the person to keep clean. On the other hand, above-counter sinks create a dramatic focal point for the room and are created in attractive and sophisticated designs that are stylish and versatile. Many people choose their American Standard sink as part of a complete bathroom set that also includes a toilet, a bath tub, and/or bathroom fixtures. Purchasing these items as a set allows the person to remodel the entire bathroom with items that are perfectly matched together creating a well dressed bathroom with products that will last for years. The many different designs and colors available from American Standard can make choosing the perfect bathroom products for your home a simple and enjoyable process.